Well it feels like it’s been an extra long – and miserable – winter this year and we always get restless waiting for the mushroom season to rev up again but we haven’t been sitting on our backsides doing nothing in the interim, oh no. We’d like to introduce our new product! 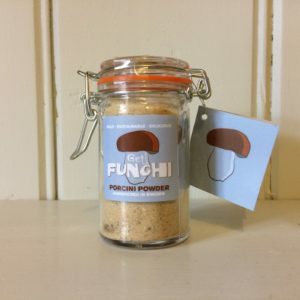 Each jar contains nothing but 100% coarsely ground dried wild porcini. Naturally the ingredients have all been hand picked by us in West Sweden, like the rest of our products. A teaspoon added to a basic white sauce transforms it instantaneously into a delicious mushroom sauce, and you can stir it into almost any other sauce or dish to add a wild mushroom kick. My sister Sarah’s top tip is to add it to pastry. It makes her cheese and mushroom pie a cut above! For now it’s only available at No 74 Deli in Bollington, Cheshire, but we’ll keep you updated about where else as we roll it out. 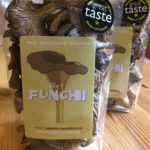 We’re also excited about our new stockist in London, Totally Swedish, who will be selling our Winter Chanterelle both in store and online shortly. As well as Swedish foods, the store sells all sorts of other Swedish products, so it’s a great place to go to ‘Scandify’ yourself. We love their recipe page with some great traditional ones like cinnamon buns and pickled herring, as well as updated versions of the classics. This entry was posted in Uncategorized by Deb Hampson. Bookmark the permalink.